Menu command Package - Insert - Full Wheel opens a new window to insert all possible combinations of selected numbers into the Package. Select the count of tickets to be created in the first field or press button All to create all possible combinations of selected numbers. For example in a 6/49 lottery there are 13,983,816 possible combinations. Entering e.g. 100 into the first field will create only the first one hundred such combinations starting with 1-2-3-4-5-6 and ending with 1-2-3-4-7-20. Then choose how many numbers each ticket will have. If you select less than the maximum count of numbers then the remaining ticket positions will be masked. The next option is the size of the number pool. Use your mouse to pick pool numbers on the ticket panel. 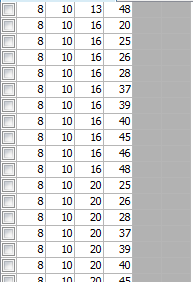 Click and drag the mouse cursor to continuously toggle the selection of panel numbers under the cursor. Hold down SHIFT key while dragging mouse in the panel to select numbers under the cursor, hold down CTRL key while dragging to deselect numbers under the cursor. Click Insert button to create the selected combinations and load them into the Package. When the generator is finished you'll see a message in main window's status bar showing how many tickets have been inserted. You can also press SHIFT+SPACE key when the button has input focus to open that menu. 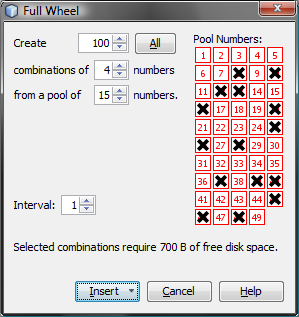 The settings in the picture above create 100 tickets, each with four numbers from a pool of 15 numbers. The pool numbers are selected on the ticket panel: 8,10,12,13,16,20,25,26,28,37,39,40,45,46 and 48. Note that the last two ticket positions are masked because only 4 ticket numbers were selected in the Full Wheel window. However with Interval option set to 3 only every third ticket from the full wheel will be created. Such tickets are highlighted with red color in the list above. This option is especially useful for Keno-like lotteries as it provides good coverage of any full wheel while decreasing free disk space demands. A message at the bottom of the window shows the disk space required to create the selected full wheel. Full Wheel window looks almost the same when playing a Powerball-like lottery. There is just another field to adjust the size of powerball pool. Also the ticket panel has boxes for selection of numbers for the powerball pool. All other options are the same. 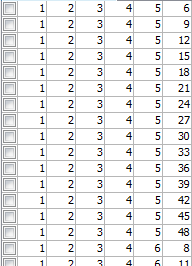 When playing a Pick 3 or Pick 4 lottery the Full Wheel window differs a little. 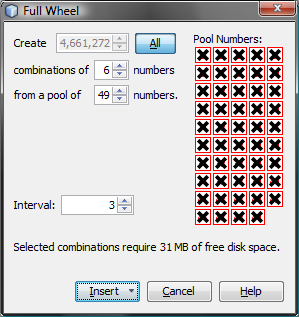 There are options to select the size of each number pool. Untick number pool check box(es) to mask appropriate ticket positions.